Global growth in the number of “things” connected to the Internet continues to significantly outpace the addition of human users to the World Wide Web. New connections to the “Internet of Things” are now increasing by more than 6x the number of people being added to the “Internet of Humans” each year. Despite the increasing number of connections, IC Insights has trimmed back its semiconductor forecast for Internet of Things system functions over the next four years by about $1.9 billion, mostly because of lower sales projections for connected cities applications (such as smart electric meters and infrastructure). Total IoT semiconductor sales are still expected to rise 19% in 2016 to $18.4 billion, as shown in Figure 1, but the updated forecast first presented in the Update to the 2016 IC Market Drivers Report reduces the market’s compound annual growth rate between 2014 and 2019 to 19.9% compared to the original CAGR of 21.1%. Semiconductor sales for IoT system functions are now expected to reach $29.6 billion in 2019 versus the previous projection of $31.1 billion in the final year of the forecast. The most significant changes in the new outlook are that semiconductor revenues for connected cities applications are projected to grow by a CAGR of 12.9% between 2014 and 2019 (down from 15.5% in the original forecast) while the connected vehicles segment is expected to rise by a CAGR of 36.7% (up from 31.2% in the previous projection). IoT semiconductor sales for connected cities are now forecast to reach $15.7 billion in 2019 while the chip market for connected vehicle functions is expected to be $1.7 billion in 2019, up from the previous forecast of $1.4 billion. For 2016, revenues of IoT semiconductors used in connected cities applications are expected to rise 15% to about $11.4 billion while the connected vehicle category is projected to climb 66% to $787 million this year. Sales of IoT semiconductors for wearable systems have also increased slightly in the forecast period compared to the original projection. Sales of semiconductors for wearable IoT systems are now expected to grow 22% to about $2.2 billion in 2016 after surging 421% in 2015 to nearly $1.8 billion following Apple’s entry into the smartwatch market in 2Q15. The semiconductor market for wearable IoT applications is expected to be nearly $3.9 billion in 2019. Meanwhile, the forecast for IoT semiconductors in connected homes and the Industrial Internet categories remains unchanged. The connected homes segment is still expected to grow 26% in 2016 to about $545 million, and the Industrial Internet chip market is forecast to increase 22% to nearly $3.5 billion. 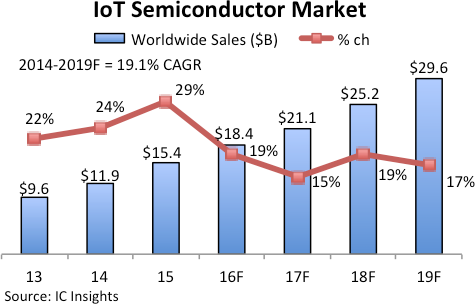 The semiconductor forecast for IoT connections in the Industrial Internet is still expected to grow by a CAGR of 25.7% to nearly $7.3 billion in 2019 from $2.3 billion in 2014. Additional details on the market for Internet of Things systems and ICs are included in the 2016Update of IC Insights’ IC Market Drivers—A Study of Emerging and Major End-Use Applications Fueling Demand for Integrated Circuits. This report examines the largest, existing system opportunities for ICs and evaluates the potential for new applications that are expected to help fuel the market for ICs through the end of this decade. IC Market Drivers is divided into two parts. Part 1 provides a detailed forecast of the IC industry by system type, by region, and by IC product type through 2019. In Part 2, IC Market Drivers examines and evaluates key existing and emerging end-use applications that will support and propel the IC industry through 2019. Other system application covered include smartphones, personal/mobile computing (including tablets), servers, medical/wearable devices, and a review of many applications to watch—those that may potentially provide significant opportunity for IC suppliers later this decade. IC Market Drivers 2016 is priced at $3,490 for an individual user license and $6,590 for a multi user corporate license.